Added on January 14, 2013 by Lara Hoke. I'm excited to begin a new portrait commission and looking forward to the challenges it will present. 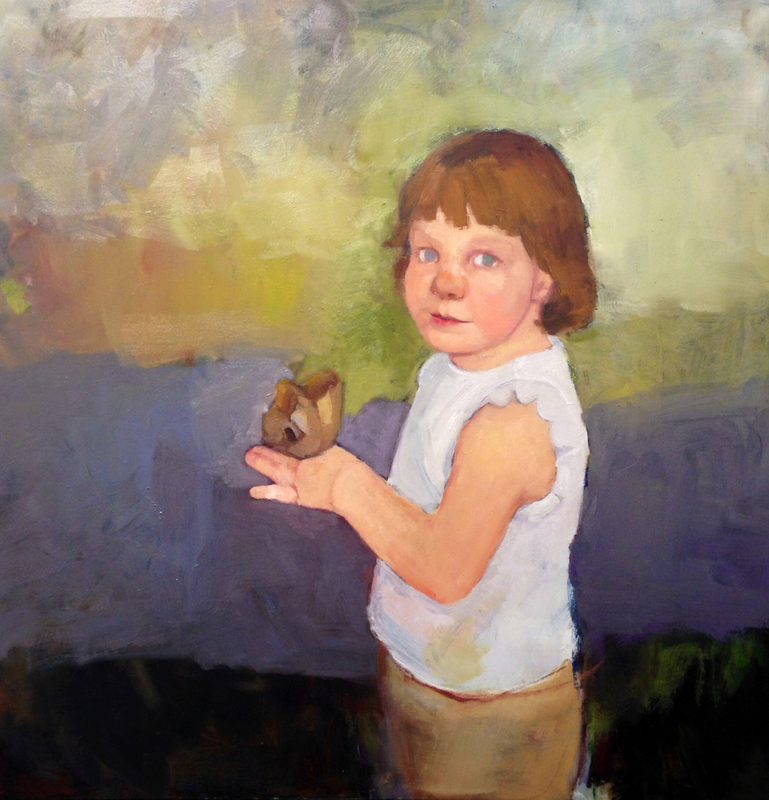 This portrait is of an adorable young girl delicately holding a butterfly on her wrist. The image was captured by her parents while visiting the Audobon Butterfly Garden in New Orleans. The painting will be executed in oil on panel. Below is a study for the portrait. Added on June 13, 2012 by Lara Hoke. Bob and Mary Galvin, Illinois Institute of Technology, Lara HokeFor the past several months I have been working on a portrait commission for the Illinois Institute of Technology. It was, at times, a struggle but I am excited to annouce that it is done and has been installed in its new home at the Paul V. Galvin Library at IIT. To the right is the final portrait and a shot from the unveiling. For better images of the portrait, please visit my Portraiture page. Added on February 8, 2010 by Lara Hoke. Coasters in Various States of ProgressA few weeks ago I was trolling Design Sponge and came across this DIY project that used cedar slices to create customized silhouettes, and I thought hey, those would make great coasters.... but where do I get the wood? Meanwhile, my month-old Christmas tree sat sagging in the corner and voila! - a project was born! Using slices of the pine tree, a stamp carving kit, and various types of stain and polyurethane, I'm working on creating an army of coasters. Army of CoastersThe first image to the left is a close up of one coaster pretty far along in the process. The second photo is of the gathering army. The next three images are paintings in progress. The first two paintings were begun months ago but never taken much further than the inititial color blocking, so I'm re-working them, trying to bringing in more colors and depth. The last image is Kim. I've addd a few more transparent layers of color but what it really needs is a few days of serious work because all of the transparent layers have caused it to lose some of it's structural believability. Looking at these paintings makes me realize two things - 1. I need to work on a big painting in which the subject is not front row and center and 2. My next portrait cannot be of a person looking to their right.